Raith Rovers have asked the Scottish FA compliance officer to investigate a potential rule breach by Rangers. The Championship club have queried whether a request to release Ryan Hardrie early from the Scotland under-19s "breaches SFA articles and rules". Rovers have Craig Wighton in the squad, who remains in Bulgaria and misses Saturday's game against Rangers. However, an SFA spokesman said both clubs were afforded the same opportunity to recall their player. In a statement on their website, Rovers said they had "asked the Scottish FA's compliance officer to consider whether he agrees that Rangers FC, through David Weir, have breached SFA articles and rules by requesting and securing the early release of its player Ryan Hardie from international duty with Scotland Under 19s in Bulgaria, for the sole reason that he is then available to play against Raith Rovers. "Raith Rovers FC also has an important player in the same Under 19 squad, first team regular Craig Wighton, and Craig remains in Bulgaria and available for selection for Friday evening's national representative match. He will fly home with the rest of the squad on Saturday afternoon. "We are delighted that Craig is receiving international recognition, and whilst we are without his services for the crucial match with Rangers, our loss is Scotland's gain. "Naturally we are concerned that if there is any breach of Article 82.1 and Rules 56 & 57, this would - in these circumstances - result in an unfairness in terms of players available for selection for Saturday's match, which is to our disadvantage." Scottish FA Article 82.1 states: "If any player selected to attend any international or other match arranged by the Scottish FA refuses without good and sufficient cause to comply with the arrangements for playing in such match or fails to attend such match, the Judicial Panel may find him to have been in breach of this Article 82.1, and any club or official or Team Official or other member of Team Staff who may be found to have encouraged or instigated or caused such player so to refuse shall likewise be deemed to be in breach of this Article 82.1 and the provisions of Article 95 shall apply." 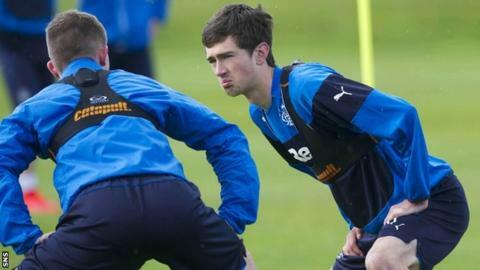 Hardie, 18, has made one appearance in the Rangers first team this season, as a substitute in the 5-0 League Cup win over Airdrieonians.